Baby, it's hot out there! 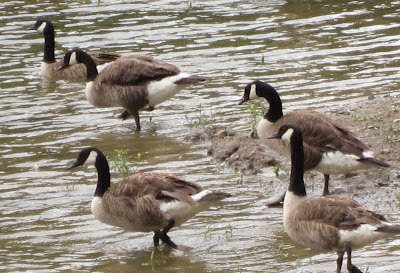 These Canadian geese have the right idea. A plunge into water can be a great way to cool down and get refreshed. I read that the first half of this year was the hottest ever in the history of my town, Pittsburgh. We didn't need professionals to tell us that. The winter was so mild, the spring so lovely and the summer so hot, it's been a constant topic of conversation for months. The heat we are experiencing is nothing to play with -- or in. The high humidity has made breathing a little more difficult for those who don't have health problems, so it has to really affect those who do have them. Even though it feels like we should be out and about all the time since It's Summer!, it's not such a bad idea to lay low and stay indoors in cool air if you can when the temps and humidity climb. Or find a gaggle of geese to join as they find a natural way to cool down.